Do you think anything any other business gift can match the charm and elegance of a pair of snazzy and custom rubberized sunglasses? It can transform any bland campaign to high hitting one with its charm and fancy appeal. A personalized rubberized sunglass makes a perfect giveaway during any fun filled party – beach party, fancy dress parties, fitness or sports promotions etc. The sunglasses offered is created out of plastic and rubberized material. UV400 lenses provide 100% UVB and UVA protection, which makes it a cool fashion accessory in any season. 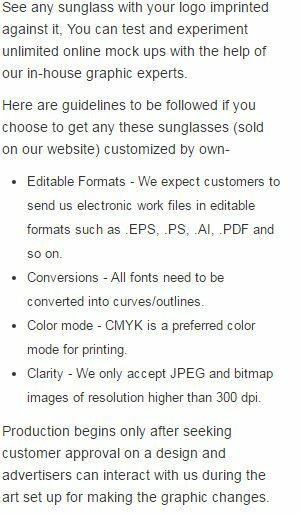 Promotional rubberized sunglasses can be favored with 20 differing temple colors such as red, black, white, blue, pink, orange, green, yellow etc. Available Colors: Black with Red, Black with White, Black with Purple, Black with Blue, Black with Pink, Black with Orange, Black with Green, Black with Yellow, White with Red, White with Blue, White with Green, White with Pink, White with Black, White with Purple, White with Orange,White with Yellow, Black with Black, Red with Red, Blue with Blue, White with White, Green with Green, Orange with Orange, Pink with Pink, Purple with Purple, Yellow with Yellow, Maroon with Maroon, Gray with Gray, Black with Maroon, Black with Gray, White with Gray, White with Maroon.